Writing on the Post Global blog operated by the Washington Post Anton Fedyashin, an Assistant Professor of Russian History at American University, speaks of a “new Russian opportunity.” We wrote to Professor Fedyashin to ask him to substantiate with source material his claim that Georgian President Saakashvili’s “luck ran out when he recklessly attacked a breakaway region with internationally-approved Russian peacekeepers in it” and to tell us about his citizenship status. He ignored our request. We consider his statement outrageously irresponsible in the absence of any attempt to cite source material, and we feel American University should be embarrassed by this shoddy pseudo scholarship. If any of our readers have any connections with AU, we’d appreciate it if they’d write Cornelius Kerwin, the school’s president, a letter of protest. Here’s his address: president@american.edu. True to his word, President Obama has launched a new era in American foreign policy. Signals from the U.S. have been positive and encouraging. Henry Kissinger quietly visited Moscow in December. Vice President Joseph Biden spoke optimistically about cooperating with Russia at the international security conference in Munich. In his first press conference, the President mentioned non-proliferation negotiations and Russia’s role in preventing other regimes in acquiring nuclear capability. Secretary of State Hillary Clinton plans to visit Moscow in March to lay the groundwork for reestablishing the U.S.-Russia partnership. And finally, President Obama and President Medvedev will meet at the G-20 summit in April. There is a veritable thaw in the air and spring looks promising. These are all U.S. moves, which could only look “promising” to Russians as signs of weakness that can be exploited. He does not mention a single act by Russians to give an advantage to the U.S. We must ask: Whose side is this guy on, anyway? We’d like to know what country he’s a citizen of, but he won’t tell us and his resume seems to be some kind of secret. If anyone can tell us more, please do. Moscow has welcomed this change, but has taken a wait-and-see attitude. Moscow responded by canceling plans to deploy missiles in Kaliningrad in exchange for slowdown of the missile defense shield deployment in Eastern Europe. However, foreign minister Sergei Lavrov snubbed Hilary Clinton’s phone call a few weeks ago; he was busy traveling with President Medvedev in Central Asia. The Russians are expanding their influence in this region by offering Kyrgyzstan financial support. Meanwhile, Moscow has opened its airspace for the U.S. to fly non-military supplies to Afghanistan. Given the emphasis that President Obama has placed on the military operation there, Russia’s cooperation will become increasingly important. Where should the State Department start to repair its relationship with its Eurasian ally? It will have to reevaluate its policy towards Russia’s neighbors. He does not criticize the Russian failure to respond in kind, but rather justifies it. His statement that Russia was merely “offering Kyrgyzstan financial support” is flatly dishonest. Russia was bribing the country to eject a U.S. military base, and he does not even mention much less criticize this blatant provocation — nor does he apparently think the U.S. should do anything to defend its interests, but rather should simply submit to Russian aggression. Moscow has historically been very sensitive to its borderlands. Over the past millennium, Russia’s geopolitical interests have changed at a much slower rate than her governments. The Bush administration targeted its two soft spots: the western borders and the “soft underbelly” in the Caucasus. Since 2003, the White House placed its bets on Georgian President Mikhail Saakashvili and Ukrainian President Viktor Yushchenko at the expense of its relationship with Moscow. However, last summer’s war with Georgia and the recent gas dispute between Moscow and Kiev have demonstrated how much more complicated the situation has become. It is not the black-and-white picture that the U.S. media paints of Russia’s relations with its neighbors. Saakashvili and Yushchenko have proved to be not only embarrassments, but liabilities. The Obama administration now has the chance to choose better partners in the region. Does the U.S have any sensitivities or soft spots that should be considered? Apparently not. Did Russia “place bets” on opposition figures in Georgia and Ukraine at the expense of its relationship with the U.S.? Apparently not. Did Russia attempt to murder Yushchenko with Dioxin? If so, this “professor” has apparently not heard about it. Does Russian media paint an equally “black and white” picture of the situation in Georgia and Ukraine? If so, the “professor” does not call upon them to change their tactics, but rather asks for unilateral U.S. submission. The recent gas dispute has demonstrated the weakness of Ukraine’s political system. President Yushchenko has repeatedly threatened to ignore the gas deal that Ukrainian Prime Minister Yulia Timoshenko negotiated with Russian Prime Minister Vladimir Putin in mid-January. Now it is likely that Moscow will loan Kiev money to weather the financial crisis. The political and international dimensions of the row between Moscow and Kiev provided valuable insight into the Ukrainian presidential campaign that kicks off this year. Hailed by the Bush administration as a reformer and patriot, President Yushchenko went out of his way to lay all the responsibility for the gas dispute at Russia’s doorstep, which was a bit too hasty. Ukraine’s economy has been sliding towards catastrophe and the gas predicament was the latest installment in the standoff between Yushchenko and Timoshenko. The Ukrainian state gas company Naftogaz and the murky intermediary RosUkrEnergo threw their weight behind different parties. Although some see this as the natural birth-pangs of democracy, it has proven a dangerous handicap during the global financial crisis and an embarrassment to the Bush administration even in its last days. At times, neither Moscow nor the EU knew which of the two leaders spoke for Ukraine. Weakness? Ukraine’s political system has proven remarkably resilient, continuing to resolve disputes through genuine contested elections despite massive interference from imperialistic Russia. Loan Kiev money? No such loan was made. Sliding towards catastrophe? Does the fact that Ukraine’s economy is failing mean Russian imperialism didn’t take place in the “mind” of this lunatic? Is he even remotely aware that Russia’s own stock market is down 80% in six months, its currency is down 30% in two months, and its reserves are down by hundreds of billions after attempting fruitlessly to prop up both? Naftogaz murky? Is this raving nationalist fanatic suggesting that Gazprom is transparent? Who speaks for Russia, it’s “president”? This is full-bore, shameless neo-Soviet propaganda coming from a purported “scholar” at a respected Ameican university. It is nothing short of an outrage and a disgrace. Unfortunately, Mr. Yushchenko has confused Ukrainian patriotism for an anti-Russian policy, which fit perfectly into the Bush administration’s containment policy towards Russia. It is true that Moscow has used its natural energy resources as a political lever. However, since Russia has subsidized Ukraine’s economy by selling it gas below market prices, it was well within its rights to expect cooperation in return. Unfortunately, President Yushchenko has equated “westernization” with NATO membership, which the Bush administration encouraged and Moscow opposed. In this entire diatribe, there is not one single word of criticism for Russian dictator Vladimir Putin, yet the “professor” has no qualms about attacking Yushchenko as some sort of barbarian — even though Yuschenko repeatedly stands for election in true contests against genuine opposition parties while Putin never does. Isn’t Yushchenko “well within his rights” to seek protection from NATO if Russia chooses to weaponize its energy resources? Apparently not in the eyes of this Russophile madman. But preventing neighbors from joining military alliances hardly constitutes imperialism or bullying. Moreover, Russia has never objected to Ukraine’s participation in the EU, the OECD, or any other non-military western institution. Mr. Saakashvili was also a Washington favorite for NATO membership. But his luck ran out when he recklessly attacked a breakaway region with internationally-approved Russian peacekeepers in it. It suits Moscow well that Georgia has two territories in what promises to be endless purgatory, because NATO will not accept a country without full territorial integrity. So if Ukraine prevents Russia from joining and alliance with Belarus, that’s just fine? If Russia prevents Ukraine from joining NATO by subverting its elections and attempting to assassinate Yuschenko, that’s just fine? Which nations approved Russian peacekeepers? Which nations have recognized Russia’s annexation of Abkhazia and Ossetia? Who attacked whom? Truly, this maniac is trying to plunge us through the looking glass and back into the darkest days of Soviet oppression. We have a traitor in our midst. Meanwhile, the gas dispute has played into Ms. Timoshenko’s hands. Her shuttle diplomacy with Moscow has given her the appearance of a savior in the eyes of the Ukrainians and the Europeans. As long as Mr. Yushchenko tried to square Ukraine’s geopolitical circle by “bringing the country into the West” via NATO–instead of via a functional and solvent economy–the gas problem persisted. Russia is willing to cooperate with a Ukraine integrated into European political and economic structures, but not with a government disdainful of its benefactor’s geopolitical interests. By suspending its unequivocal support for Ukrainian (and Georgian) membership in NATO, the Obama administration will gain a more cooperative Russian ally. Benefactor? Has this moron ever heard of Holodomor? Ally? Russia an ally of the United States? Does anyone else smell the noxious scent of Kool Aid? Washington would do better to throw its support behind Ms. Timoshenko. She has used the gas dispute to position herself as a Ukrainian patriot, a European-minded politician, and someone able to negotiate with Moscow. She has eclipsed President Yushchenko and has come out the winner in Ukrainian politics for 2009. In addition to ensuring gas supplies to her western neighbors, she has, no doubt, also negotiated support for herself in the form of Moscow’s non-interference in Ukraine’s presidential race, which Russia tried to influence in 2004. This leaves Moscow’s protégé Mr. Yanukovich out in the cold this time around. In exchange, Ms. Timoshenko will most likely soften her stance on Ukraine’s bid to join NATO and restore a stable and lucrative relationship with Russia. Indeed, she has already been negotiating the Russian loan. The end of the gas crisis signals the beginning of the Ukrainian presidential campaign in which Ms. Timoshenko has a head start. One only hopes that Georgia will also produce as practical a politician. Do you notice, dear reader, how this slimy little rat has no comment whatsoever about Russia having “tried to influence” the Ukrainian election? Do you notice how he implies that the only standard by which a Ukrainian leader can be judged is how happy they make Russia? Can we, then, judge all Russian rulers by how happy they make America?? “No doubt”? Does he actually have any evidence AT ALL to support Russia pledging to Timoshenko to cut off its support for Yanukovich in the next election? Is that what passes for “scholarship” at American University these days? This spring offers President Obama and Secretary of State Clinton a chance to restore Washington’s relationship with Russia by supporting more reliable politicians in Georgia and Ukraine. Ms. Timoshenko is a tough negotiator, but she does not equate Ukrainian interests with anti-Russian policies that create more problems than they solve. With plans to increase U.S. involvement in Afghanistan, the White House and the State Department would do well to restore cooperation with Moscow. Is it at all possible, dear reader, that by “restore relationship with Russia” this venal and contemptible neo-Soviet mouthpiece actually means “sell out to Russian dictatorship” in the manner of Chamberlain? Why can’t the U.S. choose support “reliable” politicians in Russia who have no problem with fully independents states on their borders and who wish to “restore relationships” with those states that are not based on Russian intimidation? Is that reference to Afghanistan some kind of threat? Is this “professor” speaking directly on behalf of the Kremlin as its proxy? Terrifying. How can such persons attain such status at major American universities? We beg AU to reconsider its decision to hire this scoundrel and oust him immmediately. Otherwise, the minds of its students will surely be poisoned. This entry was posted in propaganda, russia, russophiles and tagged anton fedyashin, russia. Bookmark the permalink. There is actually no wonder that the Goebbels – style propaganda of the kind is consistently spreaded by the Kremlyad. It is unfortunately too self-evident that they attach too great a significance to brainwashing the Europeans as well. I, for example, was very upset at discovering that the 24h Russia Today propaganda TV has conned its way into the German cable networks. Well, LR, you and MG are right – this is yet another piece of Kremlinoid propaganda. And this “professor” is one slimy snake, a really dishonest dirtbag. In typical rooshan fashion, he is incapable of telling the truth. Notice how he goes out of his way to imply that Yushchenko – and Ukraine – were really the ones to blame for the “complicated” gas dispute (“President Yushchenko went out of his way to lay all the responsibility for the gas dispute at Russia’s doorstep, which was a bit too hasty”). Then he contradicts himself, and admits that rasha used its energy resources as a political lever. In typical sovok rashan fashion, he speaks out of all 50 sides of his mouth at the same time. Then, he IGNORES rasha’s role in the “murky intermediary” – RosUkrEnergo, 50% owned by Kremlin/Gazprom/Putin insiders, and, as Roman Kupchinsky at Eurasia Daily Monitor has pointed out, still trying to operate in other parts of Europe. (Link to those activities, described by Kupchinsky, previously provided in a different post). And here is the piece de resistance – the “SUBSIDY” drivel. Rasha is “subsidizing” Ukraine at “below market prices,” and therefore has the right to demand that Ukraine be slaves and serfs to rasha. When the rooshans couldn’t answer the question, they finally changed it to “below cost” – but noone knows the cost, because Gazprom doesn’t disclose anything in a reliable, audited way. “Preventing neighbors from joining military alliances is not imperialism” – then what is it? So the “professor,” and the Kremlin, come up with a sovok solution – they want “practical” politicians in Ukraine and Georgia. What does that mean? First, forget your own heritage, that you are Ukrainian, Georgian, or Estonian, etc. Second, let rasha do what it wants – don’t defend your independence, your freedom, just let rasha take over. The gas dispute demonstrated the “weakness” of Ukraine’s political system? Yushchenko has criticized the gas deal made by Tymoshenko – how is that a sign of weakness? Many Ukrainians have questioned the wisdom of the gas deal between Ukraine and rasha. They are not being arrested, as they would be in rasha. It is open, vibrant, public, very vigorous discourse. It’s not monolithic, jackboot, lockstep marching to Pootler’s orders, like in rasha. Only a rashan would make the claim that vigorous public governmental discourse is somehow a sign of weakness. I wonder, then, what this “professor” would say about the British Prime Minister’s question and answer sessions, where the questions are pointed, and the discussions are no less vigorous? I don’t know who dreams up this sophistry in the Kremlin, but this is not a “professor” – this is a dunce! This has to be one of the most entertaining sites on the web. I sometimes wonder if posters actually believe what they post. Strange posted with pseudo names such as Kim Zigfeld. This guy has every right to keep such information to himself and its hypocrytical for la russophobe to expect it. Nato or the US never got involved at all? 5 billion was certainly sought by Tymoshenko and you are certainly not privy to deals or arrangements made between both countries. As for your analysis of the Russian economy its simplistic and therefore misleading. For example you do not mention that Russia keeps most of its cash reserves off shore in dollars, that it has cash reserves and has not needed to borrow like some countries including the US massive ammounts (1 trillion dollars in the US), that a weak currency can be good for foreign investment as it makes you cheaper and increases profits in net exporter countries such as Russia. Russia is in a stronger position than say the UK, a country that is a net importer with a falling pound making goods on average more expensive.Only Northern Ireland can benefit from the cross border Euro trade. No cash reserves and a debt threatening to get out of control. Hows Nato going to stop Russia turning of gas to the Ukraine? Yushchenko reputation as a corrupt and failed politican have been cemented in place by a ukrainian parlimentary investigation not Russia. If Russia was using gas as a weapon as you claim then how come they never turing the gas off during the Georgian conflict. Actually John, Georgia gets most of its gas from the Azeri’s. In addition turning off gas flows into Georgia means that the Russians will cut off their other ally in the region, Armenia. In addition Russia is in a very weak position. Its currency reserves will not meet the debt owed to foreign banks by Russian companies including Gazprom. Without getting into Dr. Fedyashin’s Russian chavinism (which isn’t surprising to most people who know a few Russians), I’d like to point out that a blog on the Washington Post website does not mean “scholarship”; It would not be considered as such by any Tenure and Promotions committee and would not be included in a tenure or promotions file (unless the candidate is shamelessly padding his file). Emailing the president of the university a) violates the spirit of free speech that you attack Russia for not having or curtailing) and b) wastes the president’s time over a professor’s opinion that is protected under the First Amendment and which the academic community is supposed to repsect anyway. Rather than being angry and sending off an email demanding Dr. Fedyahsin’s dismissal, it seems this is a rather good little bit to see the Russian mindset. Why the quotes around professor – is he not really an assistant professor at AU? He has a profile page on the AU history website and earned a PhD in history at Georgetown (his disseration title suggests his speciality is late imperial Russia)- isn’t Georgetown a legit institution? Thanks for the comment and the question! The quotes are meant to imply our disdain for the fact that this “professor” has abandoned his professional ethics and written a propaganda diatribe. Just because the forum allows it and is not known for scholarly standards does not mean he is ethically free to abandon them, especially not when he attempts to trade on them by identifying himself as a professor on his byline. it isn’t really a diatribe. A diatribe is bitter, abusive criticism or denuciation. I concede it’s russophilic and dangerous to western notions of Georgian and Ukrainian independence (which the Russians certainly don’t have). But that’s not a diatribe. A look at Dr. Fedyashin’s syllabus on Eurasia on his AU web page shows he assigns Solzhenitsyn and Vaclav Havel, perhaps suggesting a less than unwavering Kremlin line on the part of the good Dr. Like so many Russians, he may have rather ambivalent views – on the one hand hating the govt. while on the other being weirdly chauvinistic. “Actually John, Georgia gets most of its gas from the Azeri’s. Russia could have supplied Armenia through Azerbaijan. Infact such a solution could be contractually cheaper for Russia with the Gazimahammad-Shirvanovka and instead of transit pricing offsets could be used instead. Russia does supply gas to Georgia, it did during the conflict and it did not cut of supply. Cutting off Ukrainian gas when the Ukrainians took technical gas which they where contractually obligated to supply is not using gas as a political weapon as it has been claimed. One minute you say Gazprom and the Russian economy is in debt yet you expect the Russia and Gazprom to supply gas to an extremely wasteful Ukraine at below market prices is a contradiction. Again Russia like any other country is feeling the effects of the downturn. Though its position is not as weak as suggested. For example the article you linked too claims Russias total reserves are US$600bn and total foreign debt is US$527.1bn. Also note the Russia government is only responsible for companies it has a stake in so its not responsible for all that debt. Then take a look at the US national debt, 13 trillion. 6.4 trillion the the US government is responsible for. Do you think the US gold reserve comes anywhere close to covering that. As far as debt management is going Russia has been bailing out companies using its reserves, the US have had to further borrow 1 trillion. The US of course can depend on the dollar being used as the international currency. Countries such as the UK are going to find it much more difficult. With debts in the UK expected to hit 1 trillion before the end of the year, with a large portion of its gold reserves already sold. Its a net importer with a weak currency. Debt wise Russia is in a better position than most. As a net exporter a weak currency can be exploited Russia can now either reduce costs win contracts or get more cash for their product. Keeping their reserves in dollars has protected it from the falling ruble . Russia is hit by the economic crisis which all countries are. To suggest its in a weaker position than other countries is unfounded. M.C. Paul, he doesn’t have ambivalent views – the fact that he assigns Vaclav Havel means nothing. How do you know what he says about Havel in his classes? Solzhenitsyn was a Russian imperialist, as has been discussed on this blog before. Which government do you think Fedyashin hates? “restore cooperation with Russia” – where was there ever cooperation from Russia in the first place? And how do you cooperate with someone who sees their only role as a spoiler, constantly trying to poke fingers in everyone’s eyes, so that the world will pay attention to them? LR is right – it is terrifying that this guy occupies a post at any American university. There are a couple of problems with your arguments. Obviously you have NO IDEA of the recent history of the region. Azerbaijan & Armenia are still officially at war over Nagorno-Karabakh (ever heard of it), like Georgia & South Ossetia/Abkhazia it is a frozen conflict. Azerbaijan and Turkey have trade embargoes on Armenia. This information is easy enough to find. As for the gas supply to Georgia, this is mostly gas transiting to South Ossetia and Armenia. The loss of supply would not really affect Georgia, but would seriously affect Abkhazia, South Ossetia, and Amenia. I know the status of his citizenship… but I’m so not sharing. As a student of his it probably comes as a surprise for you to learn that many followers of Hitler and Stalin had similar words of praise for their almighty leader as well. They, too, felt anyone who disagreed was “insane” and shipped them off to psych wards for correction of thinking. “Obviously you have NO IDEA of the recent history of the region. Azerbaijan & Armenia are still officially at war over Nagorno-Karabakh (ever heard of it), like Georgia & South Ossetia/Abkhazia it is a frozen conflict. You clearly have no idea what I know about the region. First Russia would technically still be selling the gas to Armenia not Azerbaijan. Transit could be contracted between Russia and Azerbaijan. Estimated Turkish-Armenian trade in 2003 was $70 million. Not bad for a country with only 3.5 million people and a trade embargo. Then of course there are other alternatives even again. For example offsetting Irans supply through the Iran-Armenian line. Of course its more likely Armenia will pay Iran at least partially with electricity driving a project of a second Iran-Armenia pipeline. “As for the gas supply to Georgia, this is mostly gas transiting to South Ossetia and Armenia. So are you now accepting the independence of South Ossetia from Georgia? The cut off gas supplies would affect georgia because they receive gas as transit payment from Russia. Gas to South Ossetia was cut off incase you did not realize and was supplied successfully from Russia over a cold winter. First gas was with electricity cut off before the Russians got involved. There is not independent verification if Russian damage to the gas pipeline. I remember inaccurate claims about attacks on another pipeline in Georgia by Georgians. Maybe then you can tell me why Russia would attack a pipeline that supplies South Ossetia? Azerbaijan does not allow transit to Armenia, or even have diplomatic relations. Considering they have refused to allow transit of supplies for Russian troops in Armenia since Georgia and Russia closed their borders during the war, I think it highly unlikely that they would allow transit of gas. Once again you show your lack of understanding of people in this region. The trade you mention between Turkey and Armenia is not currently officially sanctioned at all by the government, and trade must be conducted through several intermediarys. This may change later this year if diplomacy works out, though many Armenian businessmen are praying it does not as they fear an avalanche of Turkish goods putting them out of business. Even at the height of Russian sanctions against Georgia businessmen have still found a way to trade with each other. As for your moronic statement that I accept the independance of the two repulsive regimes installed in the Georgian regions of Abkhazia & South Ossetia, when exactly do you think I said that? If I had said that the cutting off of gas from the north sea would affect England, Scotland, Nothern Ireland, and Ireland, I am not saying that Scotland and Northern Ireland are independant. In addition I will never support the recognition of two regimes that were created (with significant Russian help) by mass murder and ethnic cleansing of Georgians both in the early 90’s and in the 2008 war. For example the Abkhaz were only 18% of the population of the province of Abkhazia prior to the massacres and ethnic cleansing the Abkhaz comitted in 1992-94. By the way, Russia did not supply South Ossetia with gas during the winter. There is currently no working pipeline that would enable them to do so, though one is being (illegally) built. This once again shows a lack of upto date knowledge of Turkey, Armenia and Azerbaijan relations. Take a look at this article. Again incorrect Gazprom supplied South Ossetia with LNG. Pipelines are not the only method of delivering gas. Secondly who are you to decide if a pipeline is legal or not. What law is it violating? As for your ethnic cleansing maybe you should explain how the Georgians actually started that Abkhaz conflict when the Georgian Interior and Defence Ministry forces attacked Sukhumi under the ethnically based Georgia for Georgian policies. As for the Georgian refugees since 2004 Saakashvili has kicked them from their hostels in central Tbilisi to make way for development and has spent 70% of his budget on the military. Yet you do not mention that ethnic cleansing. As a European I am certain I have more knowledge on German history than you give me credit for. I am actually lowering myself to infant-level by answering your condescending reply, but so be it. Professor Fedyashin is in no way responsible for anything you are accusing him of, and if your concern is that he will induce propaganda in his students then don’t worry. He is an open minded man who always encourages us to think for ourselves and in no way influences our thoughts or opinions, which is more than I can say about you. Close-minded and afraid of anything outside of the U.S border. I guess it’s people like you that gives the U.S its bad reputation which is a shame because there are many wonderful Americans out there who suffer from the actions of people like you. Well John the pipeline will be violating currently accepted international law as it will be being built without the approval of the UN recognised government of the region. Just like the military bases being built in Abkhazia & South Ossetia by the Russians which the UN, EU, & US all consider illegal. As for your Stratfor article, it says “MIGHT BE” not are, and during and after the war Azerbaijan showed solidarity with Georgia, not Russia. As for Russia providing LNG, prove it. The Ossetians civillians certainly do not seem to have received any. Maybe it was stolen by Kokoity and his thugs. As for ethnic cleansing in Abkhazia, the war started when Abkhaz started attacking ethnic Georgians. Try reading “Conflict in the Caucasus” by Svetlana Chervonnaya, who was a Russian Ethnologist sent to Abkhazia shortly before the war to write a pro-Abkhaz book. She saw the build up to and outbreak of the war, and puts the blame squarely on the Abkhaz & Russians (Ardzinba in particular). She documents ethnic cleansing by separatists months prior to the Georgian government operations. Get your facts right boyo, you are looking like a russophile cretin, oh thats right, you are a russophile cretin. For example “The situation in the Autonomous Soviet Socialist Republic of Abkhazia had been tense since the end of the 1980s when the anti-Soviet, Georgian opposition began demanding independence from the Soviet Union. In March 1989, Abkhaz nationalists demanded in the Lykhny Declaration the official establishment of a separate Soviet Socialist Republic (based on the precedent of the existence of a separate Abkhazian SSR during 1925 – 1931, which was associated with the Georgian SSR by a confederative “Union Treaty”). The Declaration was signed by the rector of the Sukhumi University. Ethnic Georgian students of the university announced protests, but these were forbidden by the Georgian government. Nevertheless the students rallied and were attacked by ethnic Abkhazians. The Georgian anti-Soviet movement was outraged by the event and included the claims of the students against Abkhazian secession into its list of slogans by several thousand Georgian demonstrators in Tbilisi. As a result of the protests, Soviet troops were dispatched to Tbilisi, on bloody crackdown, in 1989. In the aftermath, the first armed clashes between the representatives of the Abkhazian and Georgian populations took place on July 16 – July 17, 1989 in Sukhumi. The conflict was sparked by the decision of Georgian government to convert the Georgian Sector of Sukhumi State University into the branch of Tbilisi State University. Abkhazians vehemently opposed to the new university, seeing it as an instrument in the hands of Georgians to extend their dominance. Although the USSR Supreme Soviet concluded, that the Georgian government had no legal right to authorize the new university, the entrance exam was scheduled for July 15. The resulting civil unrest quickly turned into militarized clashes resulting in 18 deaths and at least 448 wounded, of whom, according to official accounts, 302 were Georgians. The Interior Ministry troops were deployed in order to quell the unrest. As neither side felt strong enough to force the issue militarily at that time, the Georgian-Abkhaz antagonism had largely been relegated to the legislatures by July 1990, making Abkhazia a field of “war of laws” until the armed hostilities broke out in August 1992. During that time, the government of the Soviet Union had very few options to prevent inter-ethnic conflicts, itself being on the verge of collapse. Looks like the Abkhaz shot first now doesn’t it. As for the Refugees in Tbilisi, they were provided with housing in the suburban areas (where I live). The refugees you mention were in the hotel Adjara near Rustavelli St. They were provided with housing in my area Nutsubidze Plateau. Try again dickhead. You obviously do not know what you are talking about. By the way, the refugees are the most loyal voting block for Saakashvili (though I prefer Alasania myself) so I don’t think he has pissed them off too much. By the way, your link says Gazprom would start diract LNG supplies to South Ossetia in 2009, not that it was currently doing so. You are mistaken and I think you should read it again. If you still disagree I will spell it out to you. Russia nor Georgia see it this way. As for the UN as of yet no resolution has passed declaring military bases or gas pipeline illegal. Its unlikely to ever do so as Russia has a veto. As for the EU or US they have no duristiction over the region. 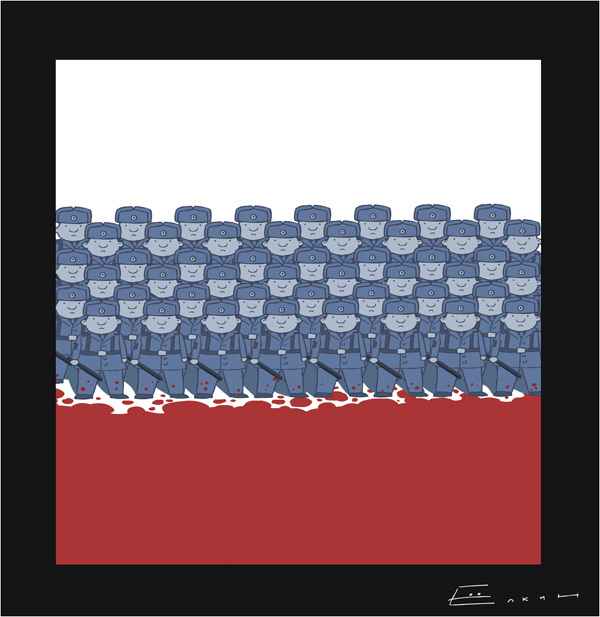 Lets look at it from Georgias point of view, Russia is an occupying force in South Ossetia. If the international court agreed with this then it must accept that when able Russia would be responsible for the safety and the well-being of all under its control. This includes heat therefore opens the for for gas supply. Are you denying that there was a policy called “Georgia for Georgians”? Or that Zviad Gamsakhurdia elected Georgia president in 1991 described ossetians as “trash that has to be swept out through a tunnel” in 1989. His policies included property rights only for those who voted for independence in the referendum in April 1991. Restrict citizenship to those who could prove residence in 1801 before Russian annexation. That the Georgian government clearly identified who where settlers and who where indigenous. That infact it was these policies that resulted in the counter policy “Abkhazia is for Abkhazians” the declaration of independance of Abkhazia and the ethnic war in the region. I noticed you forgot to mention why Abkhazians declared independence. Of course no mention of the 600,000 Azeris driving of their land by the “Georgia for Georgians” policies. Even Saakashvili described the “Georgia for Georgians” as a “poisonous nationalistic slogan”. Successive Georgian governments including the current have done nothing other than alieniate ethnic minorities and unable to crush them due to Russias intervention has only resulted in further division. The rift is too far gone to be fixed certainly in this generation Georgia should accept independance for the two break away states. John, you really are a complete moron. The 600,000 Azeri’s you mention are those driven out of Nagorno Karabakh by the ARMENIANS!! You are an idiot. Georgia and Azerbaijan have very good relations, I have been able to find NO reference to ethnic violence between the two, both have large communities living in each others territory. The “Abkhazia for Abkhazians” program developed in the late 1970’s and was directly sponsored by Moscow to be used as a stick with which to beat Georgia. It resulted in an increasing system of Apartheid in the province where 18% of the population were able to dictate to the remaining 82%. Under international law, referendums on independance can only be considered valid if all people who live in a region have the right to take part. For this reason, any referendum in Abkhazia would fail, as the overwhelming majority of the pre war population were loyal to Georgia. Which is why they were driven from the province. To allow Abkhazia & South Ossetia to have independance would be a direct approval of ethnic cleansing. Therefore you are (once again) a moron for even suggesting it. By the way, the International Court for Human Rights HAS designated Russia as an “Occupying Power” in Abkhazia & South Ossetia, and has stated that the Russians are responsible for the protection of ALL civillians and that they have not fulfilled this obligation in regards to ethnic Georgians. As for the pipeline, this is considered illegal due to the fact that there is a pipeline from Georgia. The pipeline being built by Russia is illegal because it is being built on territory recognised by the UN as Georgian. By the way John, Russia is hypocritical in all these matters as it suppresses Chechen, Daghesh and Ingush separatism with the utmost brutality. There was NEVER any ethnic cleansing of Azeri’s in Georgia. In fact their % of the population has remaind steady (with a slight increase) for decades. You really are either misinformed or a deliberately malicious idiot. The laws outlining Russias responsibilities as an occupying power only holds when the occupying power have the capability to do so. As Georgians could not control the South Ossetians etc for a decade or two its unreasonable to think Russia would be capable to do it in 5 days. If you want to debate these then fair enough though already Isee several flaws in your points, For example the Ingush are not separatists. Again a failure to read, driven off their land does not mean out of Georgia. I have provided my quote already. Well John, did you bother to read any of the links I provided? There have never been 600,000 Azeri’s in Georgia. Not in any census or demographic publishing. Therfore one can only conclude that your quote is not correct and is contradicted by the facts. I know the link you mentioned, but the fact is it quotes incorrect numbers. No Soviet census (which being a police state were quite accurate and detailed) has EVER given those numbers. So in your case, definitely a failure to read. On the question of Abkhazian separatism. This began in 1979 with the demand by the Apsu/Abkhaz minority that Abkhazia bcome a seperate state within the Soviet Union. “The secessionist sentiments are to be traced back to 1979 and 1981, when there were held numerous manifestations demaining the inclusion of Abkhazia into the RSFSR. Russia has been controlling South Ossetia & Abkhazia since the early 90’s through the FSB and the fact that over 2/3 of South Ossetian “officials” are directly appointed by the Kremlin. So considering that Russia has effectively been illegally occupying Georgian territory for 2 decades or so, they are being quite useless. As for the idiotic statement that there is no separatisim in Ingushetia well there is. So who exactly is killing federal security forces on a daily basis in Ingushetia? The tooth fairy? The issue was the ethnic policy “Abkhazia is for Abkhazians”. This was only introduced after Gamsakhurdia’s ethnic policy “Georgia is for Georgians”. Seeking separatism is not the same as the ethnic policy “Abkhazia for Abkhazians” which was not developed in the 1970s as you claim and it was Georgia who introduced ethnic based policies. Not according to international law and upto August 2008 Georgia where responsible for the people in South Ossetia etc. Clearly they where not upto the task. As for Ingush separatism I refer you to the one of your own links and i quote. Thats not the actions of a separatist state. John, you are a MORON. Once again I refer you to “Conflict in the Caucasus” by Svetlana Chervonnaya. She has an in depth and well referenced background to the creation of the separatists and also an in depth look at Gamsakhurdias nationalism. I will also remind you that once the real intent of Gamsakhurdia’s policies became clear Georgians fought a civil war to get rid of him. Pity you are so stupid as to believe that there is no separatism in the region. What is all the business about rebel attacks? The referendums held in north Caucasus states regards “integration” into the RF have been universally condemned as held under duress. In addition the RF has pursued a series of policies (such as unconditonal support for Ossetians who are universally hated by all other ethnic groups in the caucasus) at the expense of the Ingush (1992 ethnic cleansing of Ingush from North Ossetia). Sepratism in Ingushetia is a fact. Are you being deliberately obtuse or are you just thick? Russia has created, sponsored, trained and equipped the separatists. It has basically run their “governments” and derailed all attempts to resolve the conflicts peacefully. Russia has never been a genuine “peacekeeper” supporting the ethnic cleansing of the majority of Abkhazia’s population, and the ethnic cleansing of 40% of South Ossetia’s population. Not to mention Russia blocking the OSCE deployment to Georgia. If Abkahzian separatism existed since the 1970s and “Abkhazia is for Abkhazians” was coined in 1989 as my source confirms then how could that be the case. I challenge you to quote me use of the slogan “Abkhazia is for Abkhazians” before the policy “Georgia is for Georgians”! Separatism and ulta nationalist polices are not the same thing. Yet ethnic groups in South Ossetia since have seen little change in policy towards them, certainly not on august 7th 2008. Clearly as Russia and Venezuela have accepted South Ossetias independence the referendums have not been universally condemned as held under duress. Ingush are hardly all 50 ethnic groups in the caucasus. Remeber the Chechens even came and fought along side Ossetians. Though I am also sure the Abkhazians are on pretty good terms with the Ossetians at the minute. So much for Universal. I could go on. but you should get the point. Funny I could lay the same charge directly at the hands of Georgia. Using indiscriminate weapons on a residential city is hardly seeking out peace is it. Well John, separatism in Abkhazia has ALWAYS had an ethnic component because the defenition of who was an Abkhazian was based on ethnicity. Are you really trying to say that the Abkhazian separatists has no ethnic intent in the 1970’s ? Because if so you are really quite ignorant. “But, as elsewhere, policy changes after the death of Stalin allowed some degree of recovery. The Abkhaz proportion of the population rose from 15.1 per cent in 1959 to 17.7 per cent in 1989 (it is now estimated at 20 per cent); the separateness of the Abkhaz language was recognized in 1954, when the Georgian alphabet was replaced by the Cyrillic one; and, in general, the atmosphere became freer. This had an unexpected result: it allowed Abkhazian resentment to come to the surface. This was an indication that a serious problem existed. In response to repeated petitions from Abkhazian intellectuals and party officials (in 1956, 1967 and 1978), Nikita Khrushchev and his successors pursued a rather conciliatory line. The Abkhazians were the only ethnic group able to enforce a compromise on the central power by their protests. The reason was simple: they had a direct line to Moscow, through the fact that the Black Sea coast, where Abkhazia was located, was a favourite holiday destination for Kremlin policy-makers. See, they were being anti-Georgian long before Gamsakhurdia. In addition after Gamsakhurdia’s overthrow he formed an alliance with Ardzinba, hardly likely if he was the reason for Abkhazian independance efforts. One man, Vladimir Ardzinba, gained and retained the leading position in the Abkhazian movement. His evident Russian connections have given rise to the suspicion that the movement for Abkhazian independence from Georgia is really a Russian way of making sure that the pleasant seaside resorts by the Black Sea do not fall into Georgian hands. Ardzinba is, or was, a trained Moscow orientalist, specializing in the history of the Hittites. He worked at the Oriental Institute when Yevgenii Primakov (who later became Russian foreign minister) was its director. His eloquent speeches, in Russian rather than Abkhazian, in defence of the rights of small ethnic minorities, first brought him to the notice of the wider Russian public, and there is no doubt that there has been continuing unofficial support from Russia for his movement. Whether Georgian publicists, as well as the respected Russian specialist on ethnic questions, Svetlana Chervonnaya, are right in their claim that the whole Abkhazian movement was Russian-run and Russiandominated is less certain (Chervonnaya, 1994: 58). The movement for Georgian independence was intertwined fatefully with the Abkhazian question from the beginning. The Abkhazian People’s Forum Aidgylara (Unity) was set up in the autumn of 1988 to press for the removal of Abkhazia from Georgian control and its direct subordination to Moscow. It held a rally in March 1989 at which calls were made for Abkhazia to be raised to the status of a union republic. Local Georgians in Gali (a town in the south of Abkhazia) protested immediately, and these anti-Abkhazian protests spread to the Georgian capital, Tbilisi. The protesters’ demands escalated rapidly. They began to call for an independent Georgia. This was too much for the head of the Georgian Communist party, who arranged for Soviet troops to move in on 9 April 1989 and suppress the demonstrations by force. There were at least twenty deaths and hundreds of wounded. The wellnigh unanimous reaction of Georgians was to turn their backs on both the Communist party and the Soviet connection. The repercussions over the rest of the Soviet Union were also very serious: the nascent democratic movement recoiled in horror from the government’s actions. It could well be said that the Tbilisi slaughter of 9 April 1989 was the first nail in the coffin of Soviet power. In addition Georgians were not allowed to vote in either separatist referendum in either Abkhazia or South Ossetia. They held their own referendums in both cases demanding the right to remain part of Georgia. Do you deny their rights too? It is always interesting to me how people like you harp on about rights of violent separatists who commit the worst ethnic cleansing in europe outside yougoslavia (I guess you supported the serbs too?) and harp on about the rights of people to self determination, but in the case of Abkhazia you deny it to the largest ethnic group, the Georgians, and you deny it to the Georgians in Ossetia too. If the Abkhazians & Ossetians can separate from Georgia fine, but let the refugees return, and let the areas they have lived in for over 4000 years remain part of Georgia. Any objections? The referendums I was referring to in my previous posts were actually those held in Chechnya and in Ingushetia regarding independance from Russia. Obviously you can’t read. The Russian run referendums in Chechnya, Ingushetia, and Daghestan in the 1990’s and early 2000’s were roundly condemned internationally. Once again, the OSCE has confirmed, and Grist has admitted that there WERE provocations against the Georgians including the use of Artillery banned by the CIS ceasefire agreement.